I have a few teaching opportunities coming up next month and in the winter season. When I first started painting with oil in late 2006, I struggled to understand and apply everything about the medium all at once, but when I switched my mindset from having to focus on everything all together to narrowing my attention to mastering one fundamental of painting at a time, things really began to take off for me. Before that time, each painting experience had the potential of becoming emotionally discouraging and also a disaster in outcome, you know, making a bunch of mud. And in the beginning, the time I had to devote to learning to paint was precious, because I was still working as a full-time architect. Are you interested in learning to realistically paint with oils with a great deal of personal attention? If so, I will be teaching three classes this autumn. I want to share with you all that is going on right now in the studio. First off, I am preparing for a museum exhibition at the Bennington Center for the Arts in Vermont. The exhibition will open in September 2017 and run through December 2017, and I will post more about it as time gets closer and I have finally finished the painting for it. Secondly, I have finalized my teaching schedule. Cerulean (PB 35 or PB 36) Information: Semi-Opaque to Opaque depending on the manufacturer’s pigment Handling Characteristics: a beautiful, lower strength pigment that mixes well alone with white, and with most every pigment on my palette. Cerulean blue is one of my favorite oil colors and I always have it out and use it often. Each manufacturer mills their cerulean blue differently, so for one manufacturer cerulean may be an opaque paint, and where another may be semi-opaque. Even with this difference from manufacturer to manufacturer, I love incorporating this pigment into my paint mixtures. Because of the diversity and how manufacturers produce cerulean, I have found at times that I squeeze out as many as three different cerulean’s on my palette, this happened when I was working on the blue quilt in the double portrait of my daughter and her friend. At other times, when I begin a painting, I think about what I want to achieve color-wise and decide before I start the painting which cerulean will best meet my painting goals. Currently I am working on a painting with a muted but lush background and only the semi-opaque, large grained quality of the Blue Ridge Cerulean will do because of its enabling properties to create the visual vibrations of broken color so well. It is my belief that an artist must become intimately acquainted with each pigment used on their palette, this means you need to understand its physical and mixing properties, along with knowing if the pigment “plays well” with other pigments utilized on your palette. If a pigment is “bullying” in its staining and mixing traits I will shy away from using them regularly because it is so easy to go overboard and then my painting begins to be visually dominated with that specific color. Cerulean is a color that “plays well” with all pigments. You can mix fantastic grays, purples, and greens on your palette with this pigment, and visually it also mixes well on the canvas when you lay a pure cerulean tint over a color saturated underlayer. All in all, I just love working with cerulean. Row 1: Name: Cerulean (PB 36) Manufacturer: Vasari Classic Artists’ Oil Colors My Thoughts: The Vasari cerulean is made with PB 36, where all other manufacturers use PB 35. Because of this slight pigment difference the Vasari cerulean is a deeper more richly blue-green. It is one of the more finely grained cerulean’s, with an opaque covering effect. The colors straight from the tube is more reminiscent to me as the blue-green of a piquant feather--almost cobalt turquoise--that is just a smudge off from a purely saturated color, when comparing it to the other cerulean’s manufactured. Even with its pure form being slightly desaturated, Vasari cerulean is a fantastic color to have at your disposal. I love how it is a bit more green than the other manufacturer’s cerulean blues and at times I will choose to use this cerulean just because it is such a stunning color and I just want to revel in its beauty and share it in the painting. Row 2: Name: Cerulean (PB 35) Manufacturer: Williamsburg Handmade Oil Colors My Thoughts: The Williamsburg cerulean is made with PB 35, same to the other manufacturer examples except for Vasari. This cerulean is a fine-grained pigmently dense oil color that is a pure saturated middle-of-the-road blue-green cerulean. It is creamy and texture and mixes on the opaque site because it is so dense in pigments. I choose to use this in my painting when I want a slightly stronger effect and mixing power with other pigments. It is a joy to use and I have so much fun when it is squeeze out on my palette. Row 3: Name: Cerulean (PB 35) Manufacturer: Blue Ridge Oil Colors My Thoughts: The Blue Ridge Cerulean is also made with PB 35, and for the past five years it has been my predominant cerulean squeezed out on my palette. I discussed it exclusively in the blog post Favorite Paint Mixtures: Cerulean. The reason why I like using this specific version of cerulean is because of its semi opaque characteristic and it’s somewhat larger grained granular texture. It is the closest version of cerulean in oil colors that handles like cerulean watercolor pigments handle. Because it is a bit more large grained than other manufacturers when you skim a layer of this cerulean over under layers of different colors you get the visual vibrations of broken color, the same visual effects the Impressionist strived for in their work, and something I personally also strive for in my paintings. Due to its semi-opaques characteristic it is slightly weaker in mixing power with other pigments than the other cerulean manufacturers listed. However in this situation I like using it to my benefit in the visual effects I’m striving for. Row 4: Name: Cerulean (PB 35) Manufacturer: Gamblin Artist’s Oil Colors My Thoughts: the Gamblin cerulean is a very bright almost a royal blue. It mixes well and has good workability. I don’t often use the Gamblin cerulean because straight from the tube it is a bit lighter in value than the other manufacturers and I prefer starting with a slightly deeper in value cerulean when I need to use it straight. Row 5: Name: Cerulean (PB 35) Manufacturer: Winsor and Newton Artists’ Oil Colors My Thoughts: The Winsor and Newton cerulean is another excellent cerulean choice, especially if you are seeking the semi-opaque mixing attributes. I used to use it exclusively prior to discovering the Blue Ridge cerulean. This cerulean is creamy and fine-grained and handles well. In summary, I do not have an absolute favorite cerulean, but use them as I need for my painting goals. ……………………………… These articles about my color palette and the oil colors I use are the result of my experience and continued exploration. I have purchased all oil colors on my own and I have not received any reimbursement from the mentioned paint manufacturers or art supply stores. The usefulness and perceived attributes expressed here in these articles are my personal opinions. The oil color manufacturers that I will discuss in this series are: Williamsburg Handmade Oil Colors, Winsor and Newton Artists’ Oil Colors, Michael Harding Artists Oil Colours, Vasari Classic Artists’ Oil Colors, Gamblin Artist’s Oil Colors, Blue Ridge Oil Colors, Old Holland Classic Oil Colors and Rublev Colours-Natural Pigments. Cadmium Lemon (PY 35 or PY 37) Information: Opaque Handling Characteristics: Cadmium Lemon is a saturated cool yellow with minor green undertones. Cadmium Lemon mixes well with other colors and white. As I described in the first post that introduced the Cadmium Yellows, the naming of cadmium yellows is not unified and standardized, instead each manufacturer employs their own appellation to the variety of cadmium yellows they produce. I like to organize the cadmium yellows into three groups: Cadmium Yellow Deep Value, Cadmium Yellow Medium Value, and Cadmium Lemon (coolest and lightest value of the cadmium yellows). Today I want to focus on the last grouping, Cadmium Lemon. 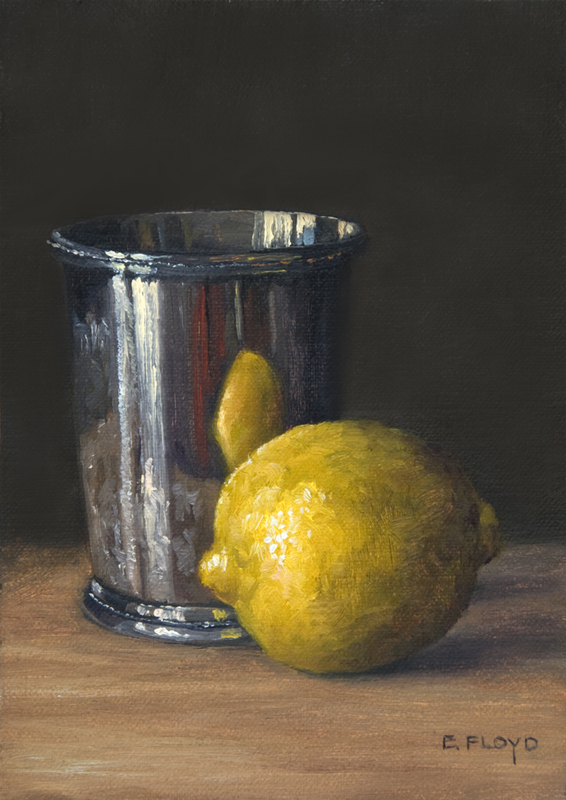 Cadmium Lemon is a color I always keep out on my palette and I value for its cool yellow color. I like how it is a powerful pigment, when mixing it with lead white to make a very pale tint a small amount goes far. Cadmium Lemon is a great color to use in flesh tones (I like paring it with cool transparent reds). Another helpful aspect of this oil color is that as a pure color tint of Cadmium Lemon and Lead White, when laid on top of other layers of paint it visually blends and creates a sense of depth and form. This spectrum of cadmium yellow may not be used as often as the Cadmium Yellow Medium Value however it is a handy color to always have out and ready on your palette. When mixing cadmium lemon, I find if you want to keep the mixture saturated it is better to choose colors that are cool in temperature. For example, if you want to mix cadmium lemon with a blue it’s a good idea to look at the blues on your palette and discern which of the blues are coolest in temperature. If you have three blues to choose from, cerulean, cobalt blue, and ultramarine blue, the coolest blue of these three is cerulean. By mixing cerulean blue with cadmium lemon your mixture will stay more saturated and pure in color. However if you would like to desaturate and mute the color mixture, the best choice is to select a warmer color. Using this example of blues, the warmest blue available is the ultramarine blue because it is a blue that has red undertones in it. Row 1: Name: Cadmium Lemon (PY 35) Manufacturer: Winsor and Newton Artists’ Oil Colors My Thoughts: The Winsor and Newton Cadmium Lemon is an excellent basic cool yellow color with greenish undertones. It is dense in pigments and mixes well while staying open on the palette for a long period of time. A tube of cadmium lemon from Windsor Newton will last a long time even when you always have some squeezed out on your palette. It mixes well with other colors and does a good job. Row 2: Name: Cadmium Lemon (PY 35) Manufacturer: Williamsburg Handmade Oil Colors My Thoughts: The Williamsburg Cadmium Lemon is slightly warmer than the Windsor Newton, Michael Harding, and Gamblin versions. As you mix in white it cools down rapidly and makes for a very pale tint. Row 3: Name: Cadmium Lemon (PY 35) Manufacturer: Michael Harding Artists Oil Colours My Thoughts: Recently I have been using the Michael Harding Cadmium Lemon and I really enjoy its handling properties. I believe it is slightly stronger in pigments than the Windsor Newton version and stays brilliant and clear and it’s pale cool yellow even in its palest mixtures. Creamy and soft in texture while maintaining its opacity makes this a lovely paint to work with. Row 4: Name: Cadmium Lemon (PY 35) Manufacturer: Vasari Classic Artists’ Oil Colors My Thoughts: The handling properties of Vasari paints are wonderful, they are lush and creamy. However the Vasari Cadmium Lemon color temperature is a tad warm (similar to the Williamsburg version) coming straight out of the tube, though it cools down quickly as it gets mixed with white. Row 5: Name: Cadmium Lemon (PY 35) Manufacturer: Gamblin Artist’s Oil Colors My Thoughts: It is my perception that the Gamblin Cadmium Lemon is the coolest yellow-green of my color scales. The oil color looks to be dense in pigments and handles and mixes well. In my color scale gradient, the lightest tint is the least strong of the examples. Row 6: Name: Cadmium Yellow Light (PY 35) Manufacturer: Gamblin Artist’s Oil Colors My Thoughts: For these color swatch scales I include colors by similarity in the color spectrum, Gamblin’s Cadmium Yellow Light is a cool pale yellow almost identical in quality to the Williamsburg Cadmium Lemon and this is why I included this oil color in this grouping. The paint is dense in pigments and mixes well and if you do not have the Gamblin’s Cadmium Lemon you can substitute the Gamblin Cadmium Yellow Light. Row 7: Name: Cadmium Yellow Medium (PY 37) Manufacturer: Blue Ridge Oil Colors My Thoughts: This oil color is also a cool yellow and is similar to the other Cadmium Lemon color swatches. This paint is not as dense in pigments as the others are, thus it is not as opaque as the other Cadmium Lemon versions are. I guess if a pale cool yellow that is semi-opaque is needed this would be a good solution an option. These articles about my color palette and the oil colors I use are the result of my experience and continued exploration. I have purchased all oil colors on my own and I have not received any reimbursement from the mentioned paint manufacturers or art supply stores. The usefulness and perceived attributes expressed here in these articles are my personal opinions. The oil color manufacturers that I will discuss in this series are: Williamsburg Handmade Oil Colors, Winsor and Newton Artists' Oil Colors, Michael Harding Artists Oil Colours, Vasari Classic Artists’ Oil Colors, Gamblin Artist’s Oil Colors, Blue Ridge Oil Colors, Old Holland Classic Oil Colors and Rublev Colours-Natural Pigments. Cadmium Yellow Medium Value (PY 35 or PY 37) Information: Opaque Handling Characteristics: Cadmium Yellow Medium Value is a rich saturated yellow and lies in the middle of the yellow color spectrum. Not too cold or too warm in color temperature and overall a lovely and versatile yellow to keep on the palette. Today I want to focus on the middle grouping, Cadmium Yellow Medium Value. Cadmium Yellow Medium is a versatile color to have out. I use it for almost every painting in some manner. When mixing flesh tones, often cadmium yellow medium value is my base yellow mixed with cadmium Vermilion and quinacridone rose to create my initial warm flesh tone. If I’m working on a floral piece, I will use cadmium yellow medium to paint the petals of the flowers and to mix the greens for the leaves and stems. I do not like using green colors straight from the tube to paint green vegetation, instead I prefer to mix the colors as I want as this enables the greatest level of variety and nuance. Cadmium Yellow Medium Value is an opaque pigment, so it is inherently strong in its tinting strength and can be used to great effect in many different paint applications. It works great when using a strong broken color methodology such as the Impressionist used. Or you can create visual depth and nuance when you lay in a cadmium yellow mixture into a previously laid down layer of transparent paint, playing with the visual effects of transparent and opaque paint passages. Row 1 Name: Cadmium Yellow Lt (PY 37) Manufacturer: Vasari Classic Artists’ Oil Colors My thoughts: Cadmium Yellow Light manufactured by Vasari is a lush and densely pigmented oil color. It has a smooth and creamy texture and mixes well. This oil color is made with PY 37 which tends to be slightly cooler in color temperature than PY 35. Row 2: Name: Cadmium Yellow Medium (PY 35) Manufacturer: Williamsburg Handmade Oil Colors My thoughts: the Williamsburg Cadmium Yellow Medium oil color is another lush and densely pigmented paint, it stays open for a long period of time which is helpful. I like it’s warm color temperature and mixing capacity. I also like how it mixes when painting flesh tones, as I tend to jump around exploring the different paint manufacturers, when I paint portraits sketches I like to squeeze out this cadmium yellow. Row 3: Name: Cadmium Yellow (PY 35) Manufacturer: Michael Harding Artists Oil Colours My thoughts: My gut feeling about the Michael Harding Cadmium Yellow oil color is that it is a softer to handle, more creamy paint than the Williamsburg version. However they are close to identical in mixing even though straight from the tube the Michael Harding is a touch deeper in value than the Williamsburg, it almost matches Vasari and Gamblin “straight from the tube” color swatch. Another attribute of the Michael Harding oil color is that it also stays open on the palette for a very long time. Staying open is a feature that I particularly value in the paint I use because I paint almost every day and like to minimize the amount of time I need to dedicate to peeling off the hardened film on the oil colors on my palette. This may be a minor inconvenience, however it goes along way in earning my favor. Row 4: Name: Cadmium Yellow Medium (PY 37) Manufacturer: Blue Ridge Oil Colors My thoughts: Personally, I have been disappointed with The Blue Ridge Cadmium Yellows. I have such positive impressions of this manufacturer's different blues (such as cerulean blue, cobalt blue, cobalt turquoise, and ultramarine blue) that a few years ago I purchased this manufacturers cadmium yellow range. My impression is that these oil colors are not as dense in pigments as other manufacturers make cadmium yellows. I have to go through 2 to 3 times the amount of volume of paint in order to attain the same mixing quality, and this bothers me. Other than that these paints do handle well, I like how soft and cream the they are but I do not use them often. Row 5: Name: Cadmium Yellow Pale (PY 35) Manufacturer: Winsor and Newton Artists’ Oil Colors My thoughts: The Windsor and Newton Cadmium Yellow Pale was the initial paint manufacturer I used because this is the manufacturer that my mentor uses. I enjoy using this paint however I have shifted away from this version because as the paint is mixed with lead white to a very pale tint the yellow shifts cool in color temperature, almost achieving a cadmium lemon color temperature. When I am using a cadmium yellow medium value oil color I want it to stay warmer in color temperature and not to shift into the cool greenish-yellow tones of cadmium lemon. Row 6: Name: Cadmium Yellow Medium (PY 37) Manufacturer: Gamblin Artist’s Oil Colors My thoughts: This version Cadmium Yellow Medium by Gamblin is a warm cadmium yellow that stays warm even in its lightest tints. It mixes well and is a dense pigment oil color, however I do not tend to use Gamblin oil colors often because I am not crazy about how they age on my palette, to me they film over and get tough after a while which makes me have to scrape off and squeeze out more paint then I would have to with other versions. This oil color is also made up of PY 37. In summary, my favorite oil paint for Cadmium Yellow Medium Value is one made with PY 35, and for handling qualities it is a tossup between whether I use the Williamsburg oil color or the Michael Harding one. Over the next few weeks, I will cover the different cadmium yellows I like to use. Each manufacturer has a different naming convention with regard to cadmium yellow. What one manufacturer would call cadmium yellow, another manufacturer will call the same visual color, cadmium yellow deep and another manufacturer may use the term cadmium yellow medium. Because of this variety in the naming conventions of cadmium yellow, I mentally divide my cadmium yellows into three categories: 1) cadmium lemon, 2) cadmium yellow (light or middle value), and 3) cadmium yellow deep (or darker than the middle range of cadmium yellows), with a subcategory in cadmium yellow deep for almost orange cadmium yellows. Each of these three divisions of cadmium yellow has a place on my palette. I will describe them each in turn, starting with cadmium yellow deep. My initial color swatches of the cadmium yellows. Cadmium Yellow Deep Value (PY-Varies) Information: Opaque Handling Characteristics: Cadmium Yellow Deep is a rich saturated yellow, warm in color temperature and overall a lovely and versatile yellow to keep on the palette. In the spring time Cadmium Yellow Deep is an important color to keep on the palette because so many spring flowers are a deep saturated yellow. In general, I always keep this color out and available, and because I love this color for its rich pigment-dense quality it is important to always be thinking about how to best mix it with other colors. So, there are times when control and moderation must be utilized, or else you will over power the color mixture you are striving for. I have heard that Salvador Dali did not like using the cadmium yellows because they can be so powerful. Cadmium yellow deep can be overpowering and it is important to always use caution when mixing with this color. When I need to employ control with cadmium yellow deep, I will often dip my paint brush into the pure paint puddle, but before taking this paint and applying it directly to my paint mixture, I will daub the paint brush in a clear space on my palette, right next to the paint mixture puddle, and slowly introduce the cadmium yellow into the mixture. This is the best way to control overly strong pigments and guaranteeing that they do not overwhelm what you are trying to accomplish. Row 1: Name: Cadmium Yellow Deep (PY 35) Manufacturer: Williamsburg Handmade Oil Colors My thoughts: Recently (like in early 2017) the Williamsburg cadmium yellow deep has become my preferred manufacturer to use. I enjoy its dense pigment, smooth workability, and how even when mixed into a very pale tint the color mixture remains in the warm-yellow color spectrum. This oil color stays open for a long time and over all it is just a fun color to keep out. Especially during the springtime and all the varieties of daffodils and forsythia are in bloom. Row 2: Name: Cadmium Yellow (PY 35) Manufacturer: Winsor and Newton My thoughts: The Winsor and Newton cadmium yellow is another favorite of mine. I like it’s mixture, it is pigment-dense and uses safflower oil as its vehicle. This makes the paint stay open for a very long time on the palette. Row 3: Name: Cadmium Yellow (PY 37) Manufacturer: Vasari Classic Artists’ Oil Colors My thoughts: In the autumn of 2016, I had the good fortune to experiment with the Vasari cadmium yellow. I fell in love with its texture and quality, I especially enjoyed its smooth buttery consistency. In its purest form out of the tube, it is my opinion that the color is a cooler and a smidge less saturated than the Williamsburg cadmium yellow deep tints. As this oil color is mixed with lead white the color mixture becomes more vibrant and almost a saturated as the Williamsburg cadmium yellow deep. The Vasari cadmium yellow is slightly cooler in color temperature, however this lends itself well in some paint applications, such as painting lemons, and probably does not make any significant change for other paint applications. Row 4: Name: cadmium yellow deep (PO 20, PY 35) Manufacturer: Winsor and Newton My thoughts: If ever I squeeze out the Windsor Newton cadmium yellow deep, I will place it right beside my cadmium orange. In fact there have been times when I have use this color instead of my cadmium orange, especially if I am working on a painting where the light is particularly saturated and golden, such as when painting during the “golden hour”. This is a very nice convenience mixture to have, however there aren’t many times when it is specifically needed, so I keep a tube of this paint available as a in special cases only, such as when I’m painting pumpkins, terra-cotta pots, or special hybrid daffodils that have particularly dark-orange center coronas. Row 5: Name: Cadmium Yellow Orange (PO 20) Manufacturer: Vasari Classic Artists’ Oil Colors My thoughts: This is another Vasari color I got to experiment with in the autumn of 2016, and I really enjoyed it. At times when keeping this oil color out on my palette, I would not bother with putting out cadmium orange, because this was so versatile. This color makes some particularly beautiful light value tints, colors that are just fun to mix and see where I can incorporate them into a painting. Like all Vasari oil colors, the mixture is pigment dense and creamy to handle, a pure pleasure to use. In summary, my favorite cadmium yellow deep oil color is made by Williamsburg, and for special times I also like to have the Vasari cadmium yellow orange available. Cadmium Vermilion/Cadmium Scarlet (PR – 108) Information: opaque, lightfast Handling Characteristics: Saturated red with a shift towards orange when used purely and when mixed with other pigments. Cadmium Vermilion is one of my favorite warm opaque reds to use. I feel as if I use this color in all my paintings in some form or another. Like Cadmium red medium it mixes well with other colors, either in two color or three color mixtures, and can make beautiful skin tones. Personally, I find cadmium vermilion to be essential for glowing flesh tones. Cadmium Vermilion is also important for mixing a variety of grays, when mixed with blues or greens the grays of silver and pewter are captured. My experience with Cadmium Vermilion, sometimes called Cadmium Scarlet (PR 108), comes from using three different manufacturers’ versions. Each version is a range of warm, orange-ish, medium opaque red. You’ll see from my swatch card that in the fourth row I have included Gamblin’s Cadmium Red Light (PR 108) also. This is because Gamblin’s Cad. Red Light really falls in to the same spectrum as the Cadmium Vermilion examples. Row 1: Name: Cadmium Vermilion (PR 108) Manufacturer: Blue Ridge Oil Colors My thoughts: Of this range of warm reds, Blue Ridge,s Cadmium Vermilion is one of my favorite oil colors to use. The first reason is because it is almost a spot on color of the red petals of an oriental poppy. Then also because it is so lush, and I particularly like how the color shifts to a pretty delightful salmon pink tone when mixed with whites. Also with this specific oil color, if you mix it down to a very, very light tint you are able to re-create the Old Holland color, Brilliant Yellow-Reddish, a color I used to always keep out on my palette until I realized it is so easy to mix with lead white and cadmium vermilion. Row 2: Name: Cadmium Vermilion (PR 108) Manufacturer: Williamsburg Handmade Oil Colors My thoughts: the Williamsburg version of Cadmium Vermilion is another favorite of mine, it starts out more red than the Blue Ridge version, thus as it tints down it maintains a pink-ish quality, however there is still enough of a touch of orange in this color that makes it nice to work with. Row 3: Name: Cadmium Scarlet (PR 108) Manufacturer: Winsor and Newton Artists Oil Colors My thoughts: During my first years of learning how to paint with oils, the Winsor and Newton Cadmium Scarlet was my orangey-red I kept out on my palette. It was the one my mentor, Danni Dawson, used and I did not switch until I began to be curious about other paint manufacturers and what they offered. After trying the Blue Ridge and Williamsburg versions, I quit using the Winsor and Newton one. Row 4: Name: Cadmium Red Light (PR 108) Manufacturer: Gamblin My thoughts: I have not explored as much with the Gamblin color on this swatch card, however because I had some of this paint I wanted to place it in its place in relationship to my other colors. Overall, it is a tossup for me in whether I choose to use the Blue Ridge or Williamsburg oil color. For several years I have been only using the Blue Ridge version, however when they had the fire in their factory a year ago and I ran low on my cadmium vermilion, I began using the Williamsburg version a bit more. I find if I start a painting with one version, I prefer to finish the painting with that version. I don’t switch back and forth between manufacturers when painting, especially if I am using the cadmium vermilion for flesh tones, it just becomes too tricky. Today I am starting a series of articles that will focus on the individual oil colors that make up the full-color palette I use on a regular basis. You may wonder why I have so many colors on my palette and why I do not use a limited color palette. This is because I have chosen to paint with oils in the colorist tradition of striving to capture the visual impression of color and light, versus focusing mostly on depicting form and letting color play a minor role in my artistic expression. By using the colorist methodology of painting, I have found that I need the most saturated version of the colors available, I then have the option to desaturate my mixtures as the situation in the painting warrants. Some of the oil colors on my palette are pure pigments and others are convenience mixtures. Let me share a bit about my painting process. I use layers of color tints (one or two colors mixed with white) to build up the three-dimensional illusion of space, mass, and value in my paintings. Often I start with pure, intensely saturated color tints, and then refine and desaturate these initial layers of color as the painting evolves by laying additional layers of paint on top of previous layers. I look for color compliments and ways to enhance the visual impression of color and light in my paintings, however I also strive to always maintain a strong feeling of form in my work. This means that modeling and getting the values accurate is equally important to me as it is for accurately capturing the color passages in my paintings. Because when you’re painting you are using a physical thing, pigment suspended in linseed oil or another medium, some colors do not mix like they are expected to if you follow the rules of color theory and because of that some pigments/oil colors are better than others when working and interacting with other oil colors. As part of my studio practice I believe in exploration and experimenting with my results and testing what different oil colors interact with others. In this past year I have decided to go back, really investigate the oil colors I use on a regular basis. In the beginning of this investigation, I just painted out a pure from the tube swatch next to a 50/50 mixture of the paint with white and labeled them. Quickly I realized this was not providing me with enough information that I was seeking, so I began to make graduated scaled swatches of each color. These upcoming articles are my way of organizing and listing out all of the relevant information I know about them. All information is derived from my own experience. I will also share tips and opinions about why certain pigments have a constant place on my daily palette. I will be comparing paints from different manufacturers and I’ll explain which one I prefer and why. This is going to be a long series of articles and I hope to post a new article each week. However at times, lulls in the frequency may occur, so I hope you will be patient. These articles on the oil colors that make up my color palette is something I’ve been working on already since June 2016 and I look forward to sharing with you some of the discoveries I have found. So let’s start with a list of the colors I keep on my palette all the time. This is my daily full-color palette set up. The first column of color swatches are the oil colors straight from the tube. For the next columns (two through five) I mix different whites I use on a regular basis with each color. In each of these columns, for each of the color tints, I tried to mix consistent volumes of white with pigment. This way it would be easier to discern the pigment density of each color and the tinting strength of the whites. The second column of color swatches are made with a mixture of Rublev’s Lead White#1. The third column uses Rublev’s Venetian White. The fourth column uses Gamblin’s Titanium White, and the fifth column uses Williamsburg’s Zinc Buff White. (Eventually I will have an article that is just dedicated to the different whites I use, these four whites are just a few of what I explore and work with. I know that there are many colors out there, however for this project, the oil colors I personally use and have explored are going to be written about. It is my goal with this project to share with others what I have learned from the different oil colors out there, hopefully you learn something as well and make better and more specific decisions about the oil colors you choose for yourself. Let’s begin (in no specific order) with a color from my palette. I have two openings in my weekend semi-private lessons. Spring term starts on Saturday, April 1st, and will go for eight sessions. (Please see details for exact dates, as spring term is interrupted with Spring Break and the Easter holiday, and two travel commitments by me). The curriculum for spring term will focus on mastering color with a mixture of color exploration exercises and painting floral still-life setups from life. Also, this year I have added a summer term. The curriculum for summer will focus on painting flowers from life in the studio and en plein air out in my garden. (A plein air easel is required equipment). The first class begins on July 8th and goes for eight sessions. *I share my studio with my beautiful and old Abyssinian, Slim. My studio is not metro accessible and students are responsible for their own transportation. I had to share a picture of our kitty Slim, she always looks regal. She is also turning 16 years old this month and is as spry as a kitten sometimes, jumping up on high shelves and scampering around! If so, I teach semi-private art lessons on Sunday mornings and currently there is an opening for this upcoming Fall Term. We meet in the intimate space of my home studio* and for the fall term we will be focusing on mastering metals. Each week you will work from a still-life setup that includes a metal object. Students work in oils. All levels are welcome. Fall term begins Sunday, September 13th Tuition is $285 for seven weeks 10am to 1pm, Sundays September 20th thru November 22th, no class on Sept 27th, Oct 11th, and Nov 1st. Please email me for more information. Supplies are not included, here is a recommended supply list for beginning oil painting students. *I live near Mount Vernon and we share the studio with my constant companion, Slim, our Abyssinian kitty. This past weekend was a monumental one for me in two ways. First, on Sunday, the reception for my first large solo-exhibition took place. In this show 25 paintings and four graphite drawings were on display, and I feel the exhibit really marks a point in my art career where all the hard work of the previous five years is rewarded. It was fun seeing my work grouped together and in a place other than my living room… and in observing the collection of paintings, it is remarkable seeing the repeated themes in my work. The second thing that I embraced this weekend is my new willingness to begin teaching group classes. Up until now, I have limited my teaching experiences to private one-on-one lessons. However, I have been considering teaching group classes more, after several weeks of thinking about it, I have decided to offer an eight-week plein air class in my home garden. This is because for the last two years I have been painting in my yard, sometimes focusing on my flowers in situ and at other times setting up still-life vignettes. I have found so much to enjoy in these experiences that I want to share it with others. My goal for this class is to cover the basics of painting and drawing outdoors with an emphasis on slowing down and enjoying the creative process of observing and creating art. Each class will include a demonstration, plus having time to paint. Students may work in oil, watercolor, pastel, or pen and ink. Weekly lessons will cover composition, color, and technique with an overarching focus on slowing down and finding appreciation in the simple details. All levels are welcome. To learn more about the class, visit the Painting in the Garden Class page, or download the class brochure to register by mail. Yesterday, I spent the afternoon preparing a white paint chart for the next online class that starts Thursday, May 2nd. Color Luminosity with Neutrals, Darks, and Lights, is a 4-week class where all the lessons will focus on how to use grays, whites, and darks to support vibrant color passages and reinforce your artistic vision. The class will have four weekly lessons plus an extra pre-class lesson about color mixing and the color wheel. Each week’s lesson investigates a specific concept and idea with an assignment designed to help the student apply these concepts to their own paintings. How to make color pulsate with simultaneous contrast. I created this class because in the past few years I have begun to realize how important it is to be comfortable with using neutrals along with lights and darks to strengthen the compositions of my paintings. Previously, I was all about high chroma compositions, that were sometimes so visually *charged* that some of the most beautiful color passages would be lost because of other not-so-important competing color passages in the same painting would take over. Once I began to incorporate larger passages of luminous grays, glowing lights and darks, the important color passages in my paintings really began to sing. If this is something you want to explore, I hope you will join in with this class and begin incorporating this valuable information into your own paintings. It is the vibrancy and richness of color that inspired me to start painting with oils. I love how some passages of paint just seem to shimmer before my eyes, enhancing my experience of the objects in the painting. When I first started painting with oils, I was overwhelmed by the multitude of color choices and how I would often end up with a “muddy” or discordant color scheme, but when I began to focus on mastering the practical applications of color theory and how this influenced the paints I choose to use, my work began to have the harmony and saturated colors I was striving for. It was during this time that I began to learn about the actual properties of the different paint pigments, armed with this additional information, I began to develop some color exercises as a means to better understand and learn the ins and outs of color mixing and how to develop my own color palette of paints. As I grew in understanding of how different paint colors would mix together, exploration and mixing color became a pleasure. I want to share this same sense of discovery and understanding with others, and this is why I developed a series of online classes dedicated to focus only on paint handling and color exploration. The first class starts next week, and we are going to dive into how to apply the practical aspects of color theory to building an artist’s color palette that works for you. The goal of the first class is to give you a solid understanding of how to adapt the concepts of color theory that focus on “ideal and perfect color” with the realities of the color pigments oil painters have to work with when establishing the color palette they work with. As a class, we will explore different color palettes used by artists, from a limited palette to a bursting with choices colorist palette. Lessons and exercises are designed to help you gain the knowledge and experience to apply color and paint mixtures with ease, enabling your creativity the freedom of expression. If you work full-time or are just unable to enroll in a painting class that requires attendance, this class is for you. You study at your own schedule, check in to the private class blog when it is convenient for you, and receive positive and helpful critiques of your paintings.